Good morning, Friends! Oh thank goodness it's Friday! It was a great time of sewing yesterday! I got a lot done on my project! So I signed up for two more days of sewing next week and I could potentially have it all done by then! But we will see… Lol! Tonight I am looking forward to a nice bbq with friends! 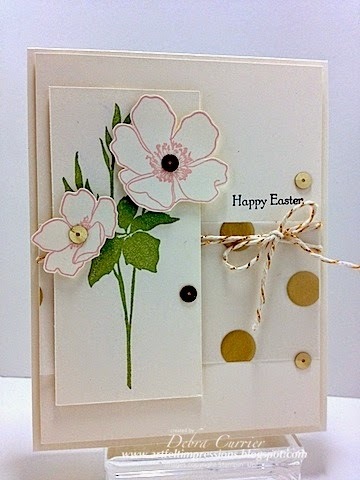 Today's card was another one that I did with my stamp club this month. I wanted to show off some of the beautiful vellum that we sell as well as some of the other gold products. Lots of layers and dimension! Thanks for stopping by and have a super day! Such a pretty card! I really like the delicate look of the flowers.